Christmas has come early to our house when two scrumptious types of chocolates landed on our doorstep this morning! I still can't believe that November is here and soon it will be Christmas. But it is no longer shocking to hear that people have starting to buy Christmas presents. It is always good to start shopping early! I will be sharing my Christmas list in my next post!Tesco have a range of affordable luxury chocolates created by master chocolatiers behind Hotel Chocolat and Harrods. They are priced from £4 to £20. 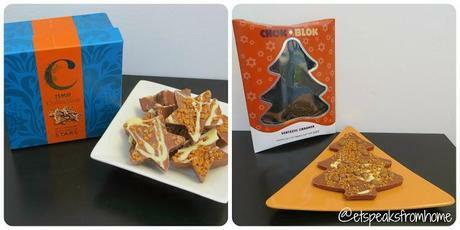 This Tesco Gingerbread Stars (100g) square box (left picture) is only cost £4 to buy. It is a milk chocolate topped with caramelised biscuit and ginger crumble and white chocolate. They are beautifully decorated bite sized chocolates. They are not overly sweet but very tasty. It didn't take us long to finish the whole box. They are definitely a great Christmas stocking filler. The box looks very presentable and pretty enough that you won't need to wrap. It is suitable for vegetarians and may contain nuts.Chokablok Santastic Cinnamon (150g) is a milk chocolate with a white chocolate swirl, topped with cinnamon, gold dusted chocolate malt balls, caramelised biscuit and ginger crumble. This is a gold and sparkly Christmas tree that you won't want to break it. But it is deliciously tempting! It can be quite hard to break up as it is quite thick. It comes with a plastic tray to protect the tree from being broken. It is a very rich, sweet and delicious chocolate. This tree is great to share and would make a nice Secret Santa present as it costs just £5. It is a great value!Life is so great when someone asks you to review chocolate! They have definitely made my day! I would certainly buy them again! Disclosure: We have received the products to do an honest review.